This is the predicted Newcastle team v Swansea and formation. Even though Rafa Benitez put out what was generally thought to be almost a fully strength team for the FA Cup last weekend, I still fancy him to make a number of changes. The manager confirmed that Lejeune, Mitrovic and Gamez were still out injured. However, Elliot and Mbemba are now available after shaking off minor injuries/knocks. Good news as well that Rafa has confirmed that Jamaal Lascelles is also available, his substitution after half an hour only being a precaution last Saturday. Starting at the back, Rafa is sure to leave Freddie Woodman out after his first team debut against Luton. I have seen some comments suggesting Rob Elliot coming back in now he is fit but with Karl Darlow having kept consecutive clean sheets and making two blinding saves in the final stages at Stoke, surely he will keep his place. Yedlin, Clark and Lascelles are surely certainties and so in defence I can only see it being a decision whether to have Manquillo or Dummett at left-back. With Dummett what you see is what you get, whilst Manquillo gives you more mobility but is right footed – I think Dummett will just get the nod. Matt Ritchie struggles to hit top form but always gives at least 100% in terms of effort and difficult to see him left out, plus he has hinted at getting some form back in recent games. Whilst Jacob Murphy impressed at Stoke, I see Christian Atsu being picked, he is very up and down with his form but games like West Ham home and away show he can be a match winner. In the middle I think it is two from three. Mohamed Diame has been a little better recently but I think it is between Shelvey, Hayden and Merino. Merino and Shelvey did ok, up to a point, against Luton. However, in the second half Luton got some joy through the middle as they went on the attack, with neither Shelvey or Merino being the quickest. I think only one of them will play and it will be alongside Isaac Hayden, with maybe Shelvey getting a game as he played pretty well at Stoke and put a goal on top of his ok display against Luton. The decent thing now is that with three wins and a draw from the last five matches (all competitions) there are positive choices to be made in the team now. Ayoze Perez has done himself no harm with three goals in the last two matches. Scoring the winner at Stoke and then two real poacher’s goals against Luton from close in. 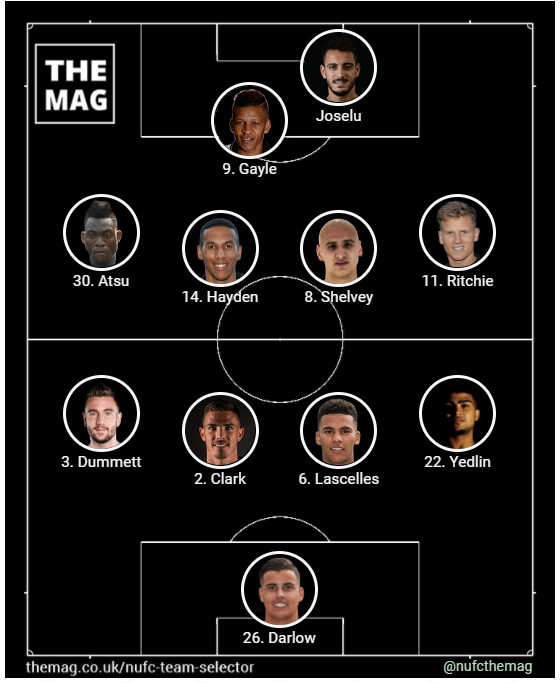 However, for a vital home game in the relegation struggle, I think Rafa will revert to the Gayle and Joselu partnership that he has favoured for much of the past couple of months, with Perez having to settle for a place on the bench. This team below would represent five changes from the Luton game, with Joselu, Hayden, Atsu, Yedlin and Darlow coming in for Woodman, Manquillo, Murphy, Merino and Perez.